Description: This long-forgotten composer was a close associate of Saint-Saëns and modelled his music on that master and on Massenet, whom he considered the next great French composer of his time. These two works present a lovely combination of surging romantic melody and rhythmic ingenuity along with contrapuntal workings which combine French and German period styles in the best possible way. Another compellingly listenable resurrection courtesy of the Palazzetto Bru Zane's foundation for discovering forgotten French romantic composers. 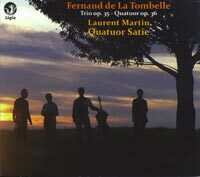 Laurent Martin (piano), Quatuor Satie.